Redistricting reform has become a cause celebre among progressives over the past decade. Gerrymandering has been around since the beginning of the country. The term itself refers to Massachusetts Governor Elbridge Gerry, who in 1812 signed a redistricting bill that favored his Democratic-Republican Party over the Federalist Party. Yet the issue really took off on the left after the 2010 mid-terms. Fueled by the Tea Party, Republicans picked up 63 seats in Congress — but more importantly, this “red wave” also elected Republicans to governorships and state legislatures around the country. Thus, Republicans not only maximized their control in Congress, but were able to lock in those gains in several states. Most notably, in Ohio — a state President Obama won twice — Republicans locked in a 12-4 map. In Pennsylvania, Republicans locked in a 12-6 map. And in Michigan, Republicans created a 9-6 map. In each of these three states, Republicans controlled majorities in both state legislative chambers and the Governorship. However, Republicans weren’t the only ones to play this game. Democrats controlled redistricting in Illinois and Maryland. After the 2010 wave, Republicans held 11 out of the 19 seats in Illinois. During redistricting, Democrats eliminated one GOP district and drew 4 others into more competitive districts (they all lost in 2012), flipping the state to a 12-6 Democratic advantage. In Maryland, Republicans held two seats out of eight – the Republican Eastern Shore and the Republican panhandle. After the 2010 elections, Democrats drew the lines to include Montgomery County in the panhandle district, creating a 7-1 map for Democrats. I skipped one state that is frequently mentioned in these discussions: Virginia. After the 2010 elections, Republicans held an 8-3 majority in Congress, but Democrats retained control of the State Senate. Thus, a compromise would have to be reached. The General Assembly agreed: the Republican-controlled House of Delegates would draw their own lines, the Democratic-controlled State Senate would draw their own lines, and they’d pass an “incumbent protection” Congressional map that kept things as they were. There are other states you could look at, not to mention state legislative districts, to get a comprehensive view of the issue. But the point remains that gerrymandering is a common tool used by both parties, and it happened to benefit Republicans the most recent go-round in 2010 because it coincided with a GOP wave election. Whenever new lines are passed, those on the losing side often bemoan their loss of power and prepare themselves for permanent minority status. However, the political environment is fickle, and things change. As a result, by the end of this election cycle, Republican-drawn advantages in several of the states listed above may evaporate. Some of these were impacted by judicial rulings prior to the election. Here in Virginia, legislators had to redraw the 3rd and 4th Districts to abide by a court ruling. This brought the map to a 7-4 advantage. In Pennsylvania, the state Supreme Court threw out the old maps and drew new ones; as a result, Democrats are poised to gain a minimum of three seats, and as many as seven. There’s two approaches here: (1) Shore up your solid districts, and let elections determine the outcome of the swing districts, or (2) swing for the fences and weaken each of your solid districts to make six districts that lean in your direction. All of a sudden, the political environment shifts underneath your feet, and things that were true at the beginning of the decade no longer apply. As a result, you end up with only one or two districts left, rather than the four you could’ve secured. This happened already in Virginia to both parties. Democrats drew their state senate lines with the narrowest of margins to protect their 21-seat majority and lost it in 2015, thanks in part to already-competitive districts shifting just a few points more Republican. Republicans, meanwhile, enjoyed a 65-seat majority for most of the decade, only to almost lose it all in 2017 when the suburban advantage they relied on shifted underneath their feet. It also threatens to happen across the nation. In North Carolina, as many as five districts once considered solidly red are now competitive; in Michigan, two districts are considered likely to flip, with another three considered more competitive than usual; in Ohio, Republicans just narrowly prevailed in a special election in August in a district drawn to include more suburbs. For all the leftist garment rendering over gerrymandering, it portends to be a significant basis of the Blue Wave, if one develops. There’s a factor that liberals either haven’t or refuse to consider: that by clustering themselves into urban areas, particularly cities or young professional enclaves like Arlington, they inefficiently distribute their voting power across the country. Want to see this in action? In January of this year, FiveThirtyEight published the Redistricting Atlas. It’s an amazing tool, down to the precinct level, to show the wide range of possible outcomes in redrawing maps. It has options for partisan redistricting, racial considerations, and compactness. More importantly, it offers an easy comparison of the number of seats each party can expect to hold. Compare the compact gerrymander with the current lines above. There’s 34 more competitive districts, but they came from 15 Republicans and 19 Democrats — a pretty even split. But more importantly, this compact formulation gives a 30-seat advantage for Republicans, as it exacerbates the liberal clustering issue. Twitter challenge: Wisconsin has a partisanship score (PVI) of EVEN. Below, I've drawn a GOP gerrymander where 6/8 districts have a score of R+7 or higher. Btw, I picked WI in honor of the upcoming SCOTUS decision. And no, I don't care about compactness. You can split Madison & Milwaukee in as many districts as you want. 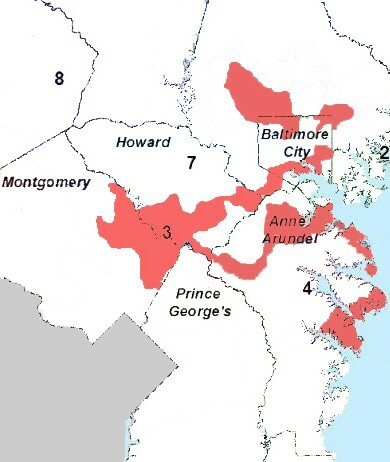 Needless to say, no one won; the closest anyone came created six districts far more grotesque than the Maryland 3rd map above. It boils down to a simple math problem: the most populous liberal precincts are also the most liberal precincts, which means they can’t be split up, and the overwhelming partisan advantage Democrats enjoy in these precincts is contained. Democrats won the 2017 House of Delegates popular vote 53 percent to 44 percent, but because so many of those votes were in places like Arlington, the votes offered no benefit to winning a majority of seats across the state. If you follow elections, you’re probably familiar with the initials “PVI.” This is Cook’s Partisan Voting Index, which basically says how Republican or Democratic a given district is. You can read the explanation for it here, along with the PVI for every Congressional District. Out of 435 Districts, 233 have a PVI of R+1 or greater and 192 have a PVI of D+1 or greater (another 8 are even). For comparison purposes, at the state level, the most “blue” blue states are Hawaii with D+18 and Vermont with D+15, and the most “red” red states are Wymoing at R+25 and Oklahoma at R+20. So there are 25 Democratic districts that are twice as Democratic than the state of Vermont. Back in 2008 and 2012, there was a game to find inner-city precincts that recorded 100 percent of the vote for President Obama. There were dozens across the nation, but more broadly, it is routine to find, even without Obama on the ballot, precincts that vote Democratic by an 80/20 split or higher. Meanwhile, the most rural counties vote Republican at a level closer to a 65/35 split. There are plenty of valid reasons to support redistricting reform, and you may agree or disagree with any of them as a point of personal preference. But redistricting reform won’t change the math. The reason why it requires Democrats to win the popular vote by seven or eight points to win a majority of seats, whether nationwide or even in Virginia, is due to Democrats distributing themselves significantly more inefficiently than Republicans.